Celebrate 100 days of learning with these printable craft activities and worksheets. Cut, color, and build a crown to wear on the 100th day of school. Make a pair of funky glasses for celebrating the 100 days of school. Cut out the letters in the words ONE HUNDRED and rearrange them to make new words. This activity includes primary-ruled lines for students in kindergarten through second grade. Cut out the letters in the word ONE HUNDRED and rearrange them to make 3, 4, and 5-letter words. This activity includes a scoring system and is designed for intermediate students in 3rd through 6th grade. Student count to 100. 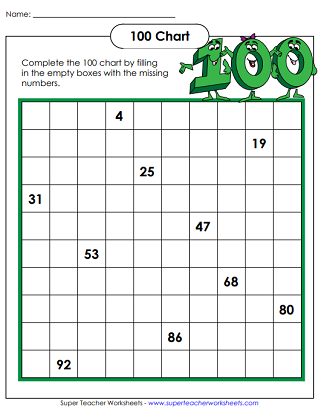 Fill in the missing numbers on the hundreds chart. Color this festive picture of kids celebrating. They're holding up a sign that says, "One Hundred Days Smarter!" Write a creative story that explains what's happening in the illustration. The picture shows kids holding up a sign that says, "100 Days Smarter!" 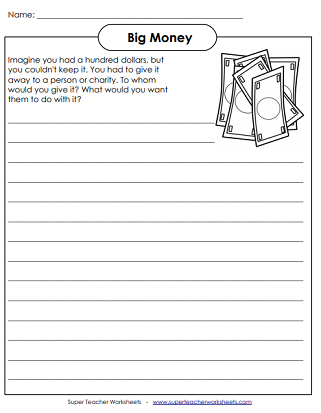 Imagine you are given $100, but you aren't allowed to keep it. You have to give it to a person or charity. Who would you give the money to? What would you want them to do with it? Here's a cute poem to read with your students on the 100th day of school. The main character in this story doesn't know what to bring to school on the 100th day. Solve the basic addition problems, the cut out the squares and glue them in the correct places to reveal a fun 100 Days mystery picture. Find the answers to the basic subtraction problems and place the squares in the right order to reveal a fun mystery picture. These are two-digit problems that require borrowing. 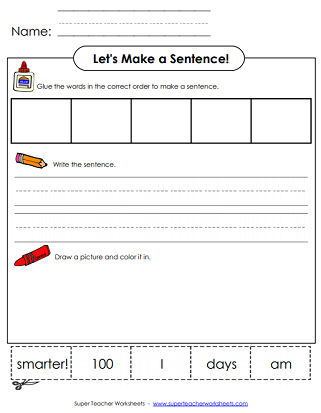 Cut out the words and use them to build a sentence that says, "I am 100 days smarter!" Glue the words in the correct position and copy the sentence onto the primary-ruled lines. We have worksheets for just about every holiday.